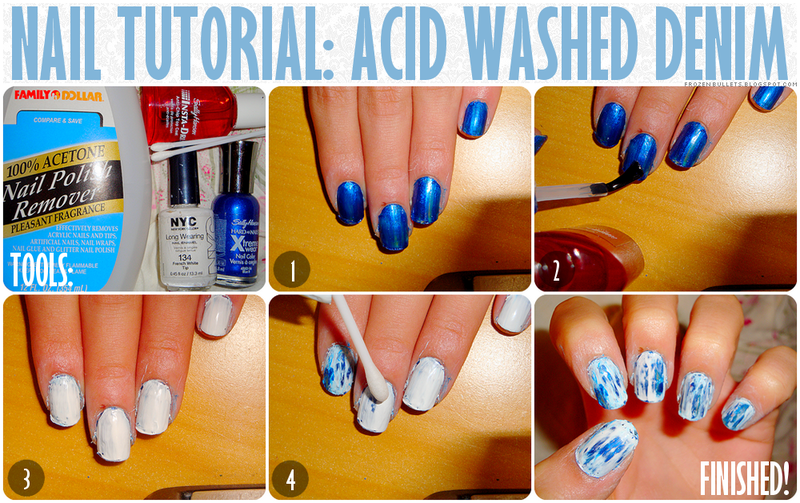 nail tutorial: acid washed denim. after your first layer(s) of nail polish dries, apply a top coat. this will give your previous polish more protection when using the nail polish remover. using a cotton swab, dip it into nail polish remover and lightly go over random areas of your nails. don't stay in one place too long or all of your layers of nail polish will come off. ★ when your design is finished drying, apply a top coat to make your manicure last, and to add an extra shine! ★ use a q-tip dipped into nail polish remove to clean up around your nails.